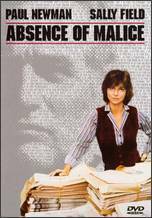 Absence of Malice is a 1981 film which tells the story of Michael Gallagher (Paul Newman), the son of a dead Mafia boss who discovers that he has become a front-page story in the local Miami newspaper, indicating that he is being investigated for a murder he didn't commit. 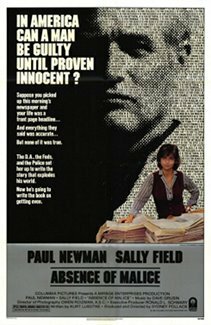 Sally Field is the reporter who creates the story. As their worlds start to coincide, the ethics of journalism are tested, including how close a reporter should get to his or her source. The movie also stars Bob Balaban as an ambitious and unscrupulous Assistant United States Attorney, Melinda Dillon as a troubled friend of Gallagher's, and Wilford Brimley as a senior U.S. Department of Justice official. The movie was written by Kurt Luedtke and David Rayfiel (uncredited) and directed by Sydney Pollack. It was nominated for Academy Awards for Best Actor in a Leading Role (Newman), Best Actress in a Supporting Role (Dillon) and Best Writing, Screenplay Written Directly for the Screen.